This page is for those who want the instructions to build a hexagonal lego tower. The cross-section view of the tower is a regular hexagon. We will build this tower using only multiple of 2x3 bricks. In this example, I used 36 2x3 bricks but you can certainly use more bricks to build a higher tower. It would be nice to share your photo by attaching it at the end of this page and tell us how many bricks you have used. If you are ready now, let's have a fun learning to build a hexagonal lego tower. Prepare to be ready with many 2x3 bricks here. Any color combination will be fine. Here I am using two color combination of yellow and red. Get three of 2x3 bricks. Here I am using yellow 2x3 bricks (#300224) but any color of three 2x3 bricks will be o.k. Prepare to drop one of 2x3 bricks. 1. Prepare to drop the 2nd 2x3 brick. Here we are trying make a triangular layout with yellow bricks. 2. Prepare to drop the 3rd 2x3 brick to complete a triangular layout. 3. Now, I am bringing a miniture light bulb at the center of the tower to light the inside. You can skip this if you don't have a light blub. 4. Get three of another 2x3 bricks. Here I am using red bricks (#300221) but any color would be fine. Prepare to drop one. Make sure to connect this brick to two yellow bricks. Now, let's drop the 1st red 2x3 brick. 5. Make sure that the connection is secure. Prepare to drop the 2nd 2x3 brick to connect it to two yellow bricks. 6. Prepare to drop the 3rd 2x3 brick to complete the connection with yellow bricks. 7. Now, we are about to build a 3rd story tower. Geometrically we are repeating the 1st story layout. So I will be using yellow bricks here. But any color combination would do fine here. Prepare to drop 1st 2x3 brick to connect with two red bricks. 8. Prepare to drop 2nd 2x3 brick to connect to two red bricks. 9. Prepare to drop the 3rd 2x3 brick to complete the connection with red bricks. 10. Here we are about to repeating the 2nd story tower layout. Prepare to drop 1st 2x3 red brick. 11. Prepare to drop the 2nd brick to connect to two yellow bricks. 12. 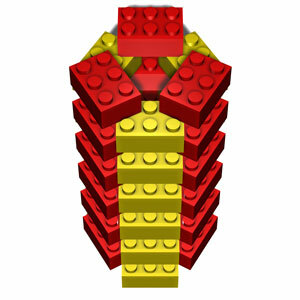 Prepare to drop the 3rd brick to connect to complete the connection with yellow bricks. 13. Now, you have completed with a four story lego tower. Now, you got the idea how to build a higher tower. You just have to repeat the piling up of bricks. I assume that you now know how to add more. I will just show adding eight stories using 24 bricks. 14. You got the ideas, right? You can build a higher tower than the one that I have just shown to you. 15. Congratulation! You have completed making a hexagonal lego tower. You will need many 2x3 bricks here. Here I just used two color combination of yellow and red. But any color combination will be fine here. Here we are building 12 story lego tower. So we will need 36 2x3 bricks here. 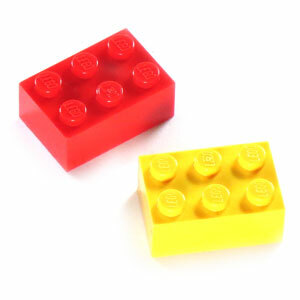 In this example, you need both 18 yellow 2x3 bricks (#300224) and 18 red 2x3 bricks (#300221).